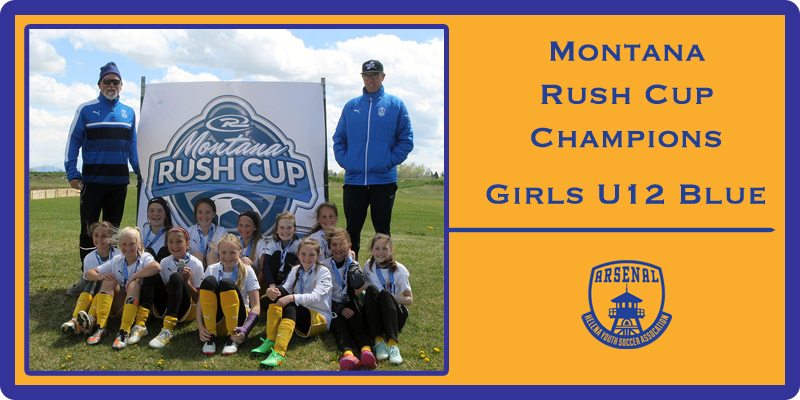 Arsenal Girls 2005 Blue Team coached by Sean Lawlor and Jamul Hahn, captured the U12 girls’ championship at the Montana Rush Cup in Great Falls this past weekend, beating the MT Rush 2005 (3-1), MT Rush 2006 (7-0), Helena Arsenal 2006 (3-0), and the MT Rush 2005 in the championship game (4-2). Providing scoring for Helena throughout the tournament were Logan Todorovich (5 goals), Tess Lawlor (5 goals/1 assist), Morgan Hayes (2 goals/2 assists), Madi Todorovich (2 goals, 1 assist), Avery Kraft (1 goal/3 assists), Sydney Emmons (1 goal/1 assist), Josie Esponda (1 goal) and Astri Hahn (1 assist). Solid goal keeping was spearheaded by Morgan Kaufman, with Brooklyn Brisko and Celi Chapman also sharing time in the net. A formidable defense was led by Lauren Hoxie, Chapman, Emmons, Brisko and Esponda, with strong midfield play provided by Lawlor, Logan T. and Madi T. Isabelle Linder, Kraft, Hayes, and Hahn provided the spark on the forward line. The U12 girls are 5-2 in tournament play and 5-1 in conference play for the season thus far.